2014 may not be over, but our birding year seems finished. We have had an early cold spell and an early snow storm (about 10 inches here). Perhaps we will get a late season Pine Grosbeak (we can get them in December), but our local lakes froze over about ten days ago, so we won’t see any more Trumpeter Swans or any late season Buffleheads. We had been getting Bald Eagles, but I can imagine that any around here will be going soon. Ever since I broke my ankle last year, my birding has slowed down a bit. I am just about able to take longer walks now but I wouldn’t trust myself on snow and ice. So, I am not walking the dog and seeing what she scares up each afternoon. I have taken many fewer photos than in 2012. When I look at the numbers of birds seen, it doesn’t look so bad, but it hasn’t been a good year no matter what the number say. We had a very wet spring and the local lakes never went down. A lot of birds we see along the shore simply weren’t visible. 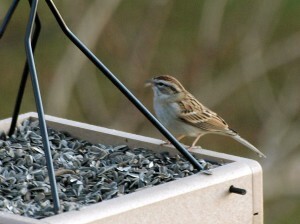 I didn’t see any Swamp Sparrow this Fall. In general our numbers were down. 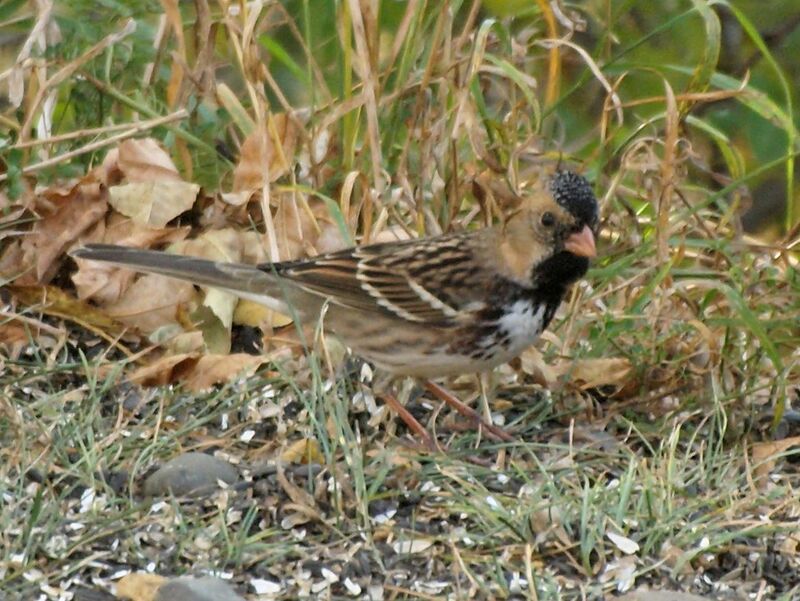 We didn’t get any White-crowned, Harris’s or Fox Sparrows this Fall. 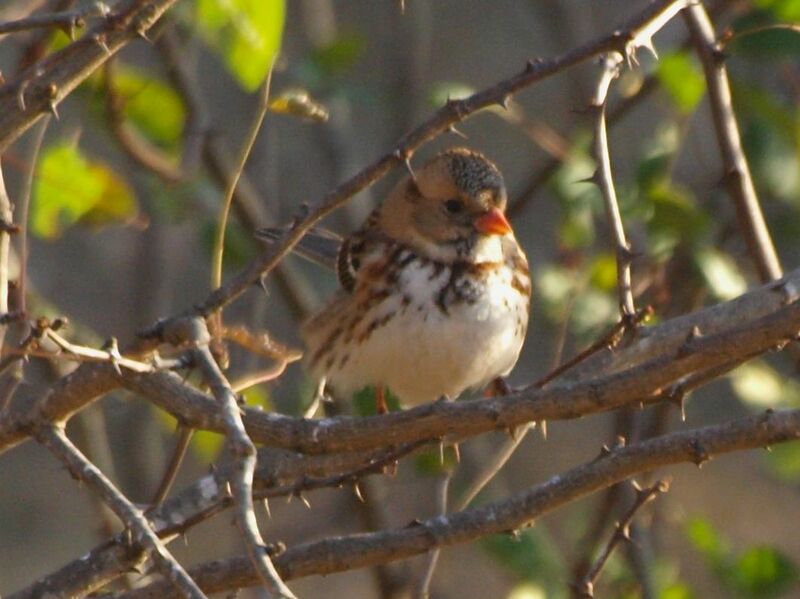 (We can still get a Fox Sparrow, of course.) So I am looking forward to a much better year next year. Better mobility for me and perhaps a lower lake level to show off the birds. On the top of the page you see a Pileated Woodpecker from November 6th. Here are a few recent photos. 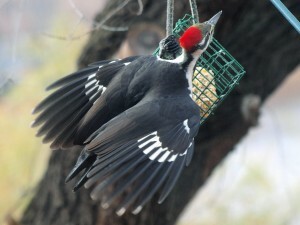 We’ve had Pileated Woodpeckers almost every day. 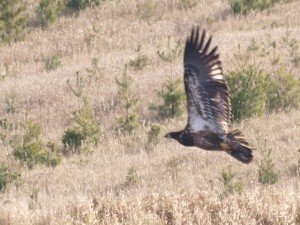 I have posted a photo of a young Bald Eagle that we saw near a local lake. To the right is a photo of a few men putting an icehouse on the lake. Very early, the earliest anyone I know can remember. This makes it really look like Winter (if the snow doesn’t already put you in the mood). It is almost the end of October. We spotted 52 different species so far this month. 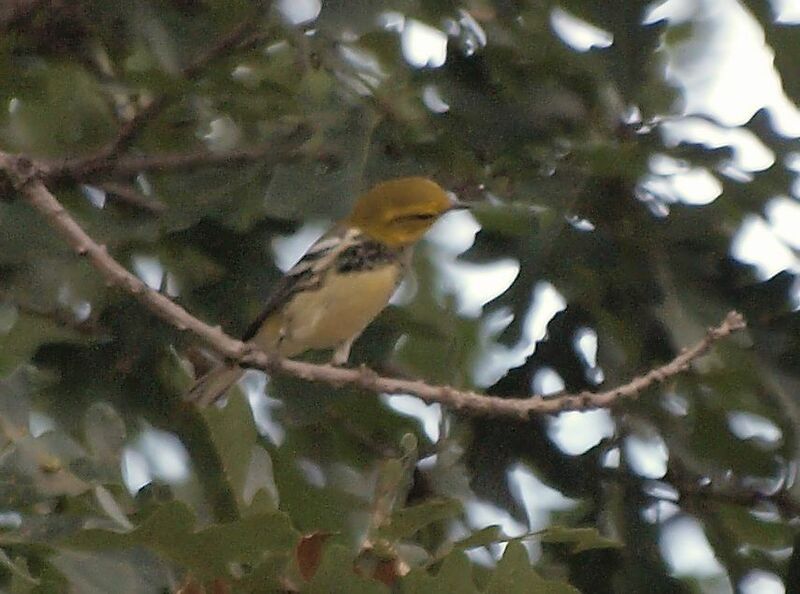 Early Fall is over, the last warbler of the season, the Yellow-rumped left us on Oct 22. 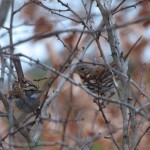 We still have 2 White-throated Sparrows that seem almost determined to stay, but I am sure they will gone to soon. 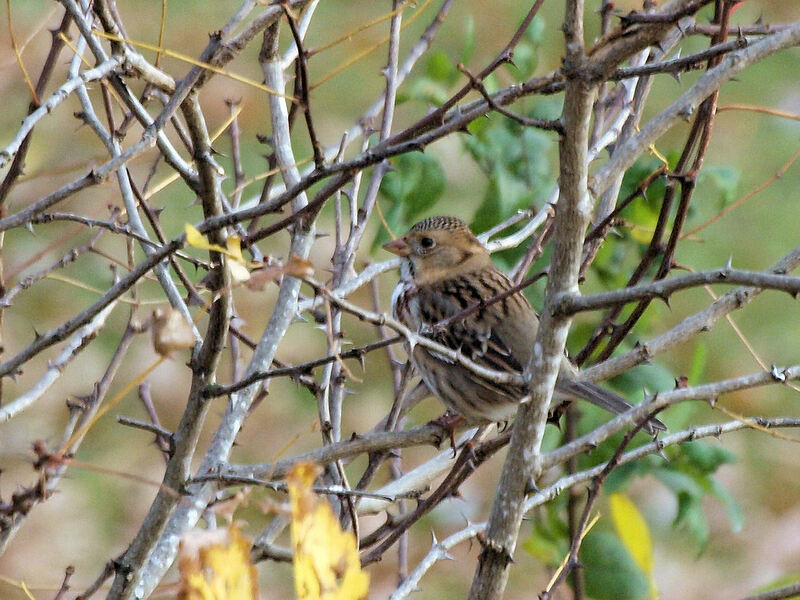 The late fall birds are here. 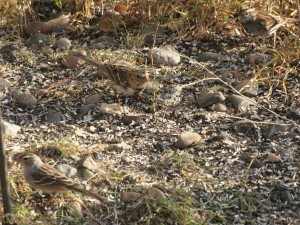 Fox Sparrows have started to show up, almost every day. 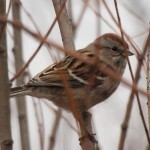 We have started seeing American Tree Sparrow. 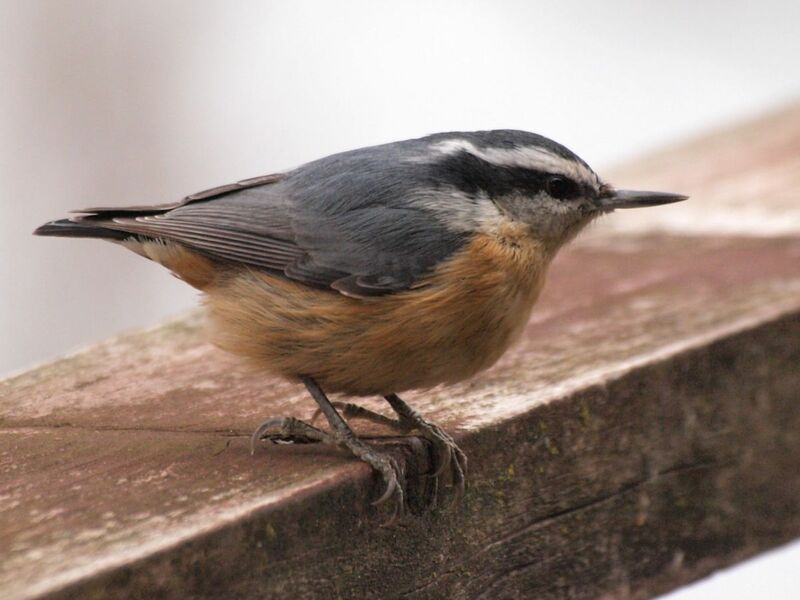 Mostly they have come to the lake landing, but I hope they visit our feeders. Red-breasted Nuthatches and Siskins have been regular visitors for the last few weeks. I have no idea if they will stay through November but it is nice to see them. 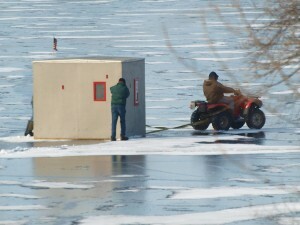 The lake will be frozen by the end of November so we are using every opportunity to see visiting waterfowl. We have had the odd Swan or 2 since September. 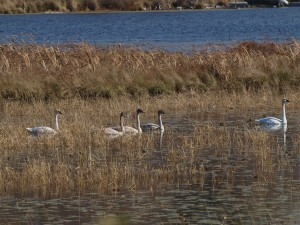 Today there must have been 10 or so, Trumpeter Swans, far enough away to make identication difficult. 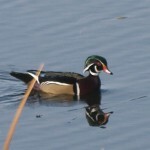 We are getting Wood Ducks and Pied-billed Grebes every day. 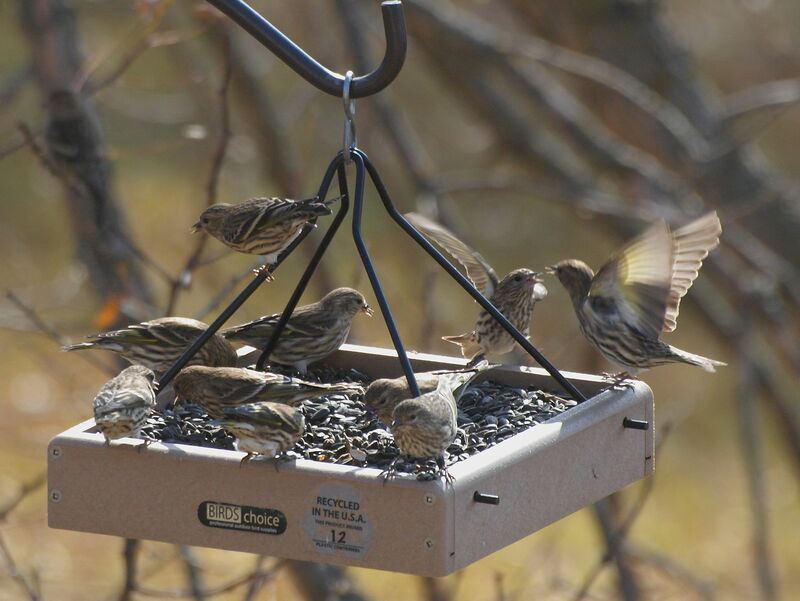 The October slowdown in bird observations is in full swing. The trees have lost most of their leaves. 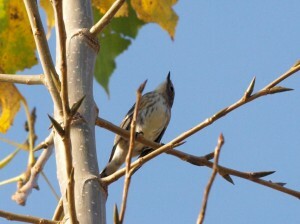 The migrating warblers may be done. 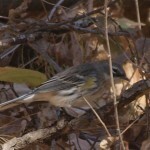 I saw one Yellow-rumped Warbler yesterday but the noisy active flocks are gone. 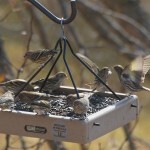 Our migrating Sparrows are slowing down. 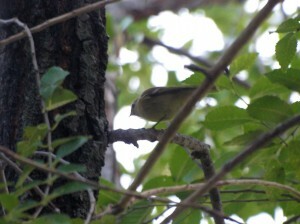 From multiples of White-throated that have been visible for a few weeks were are left with stragglers. 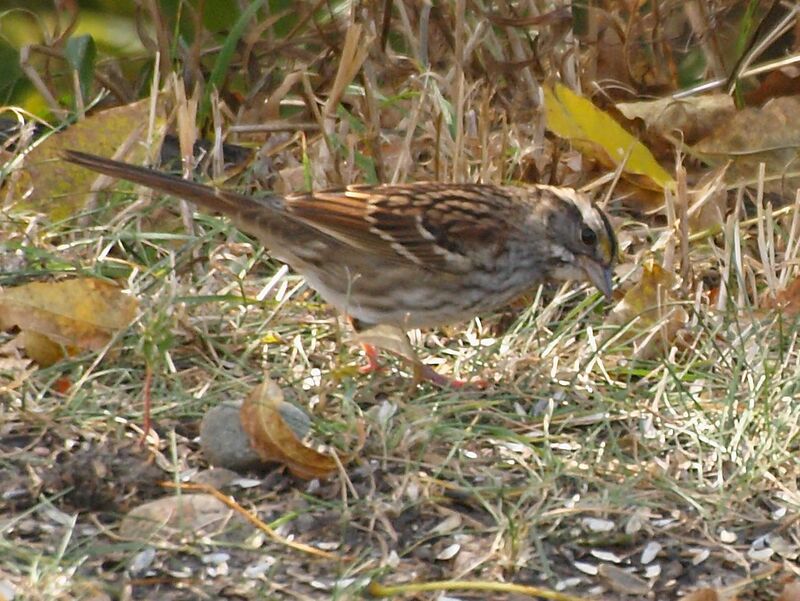 So, today I saw one White-throated Sparrow and one Harris’s Sparrow. I took my last photo of a White-crowned for the season on Monday. 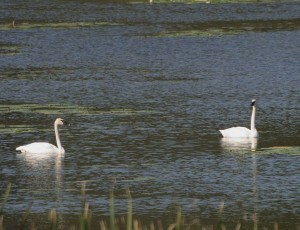 There are many birds that nest in Minnesota that avoid busy lakes during the summer. Now that our lake is more or less empty we are starting to see those birds more regularly. 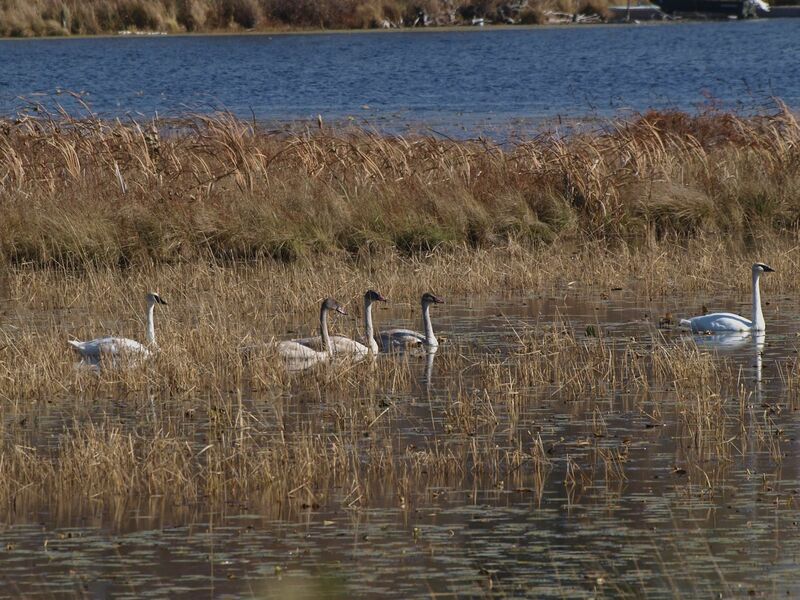 We actually been seeing Swans irregularly since early September. 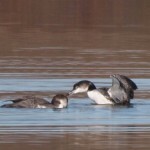 The loons have lost their summer plumage and are ready for winter. When I walk Sierra in the afternoon. 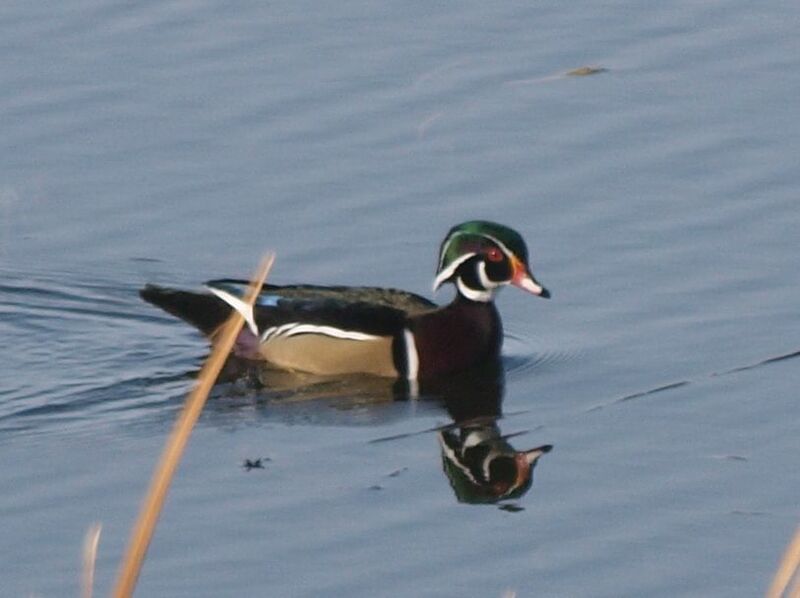 I usually manage to scare a Wood Duck or two. 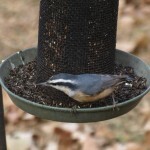 For the last week or so Red-breasted Nuthatches have been active in our yard. They are not too skittish but they have a habit of grabbing some food and running for cover so they don’t linger at the feeder for long. 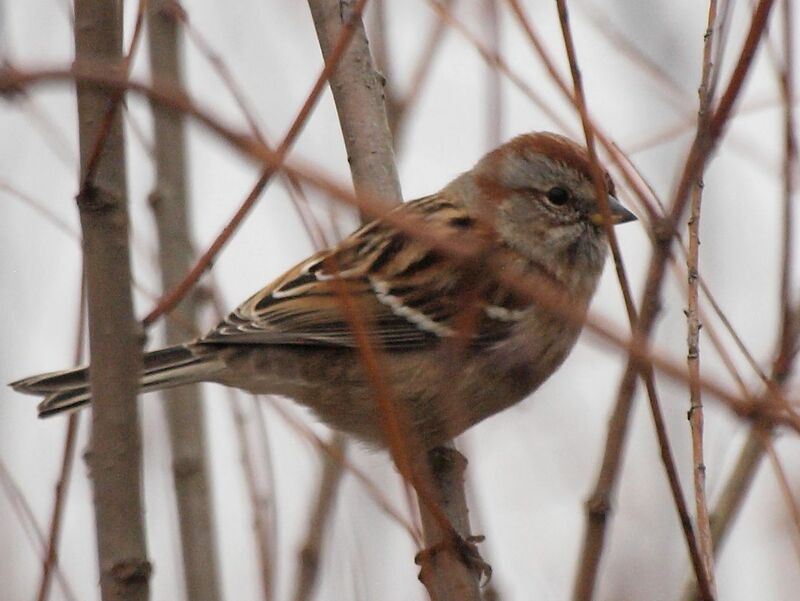 They are visible in Minnesota most of the year but only erratically at our feeders. So, we don’t know how long this visit will be but we will enjoy it while it lasts. 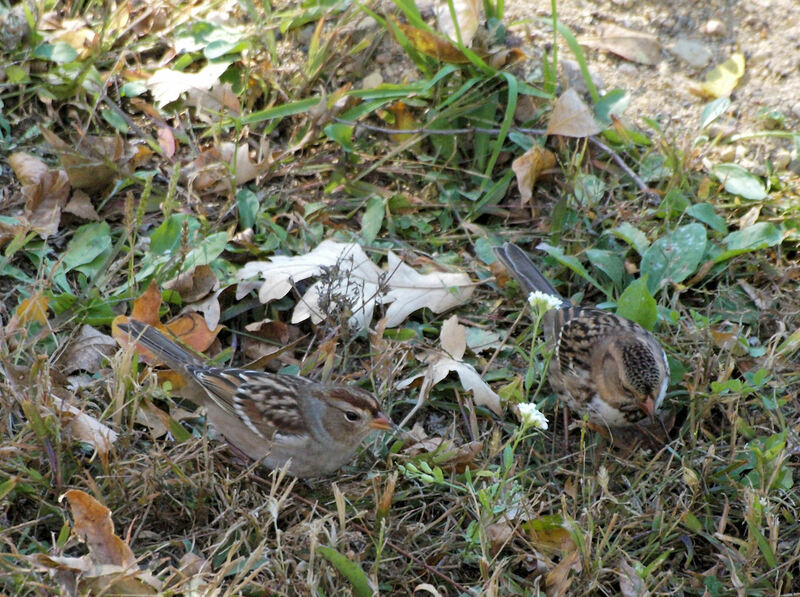 I could have titled this post ‘Welcome Zonotrichia’ since that is the genus of Sparrow I am talking about. Each Spring and Fall we are visted by 3 closely related Sparrows: the White-throated Sparrow, the White-crowned Sparrow and the Harris’s Sparrow. This year the visits have come earlier than usual. The White-throated showed up on Sept 3rd. That is 3 weeks earlier than normal. The Harris’s has been around since Sept 24th. The White-crowned arrived on Sept. 26, which is about normal. These birds are just passing through on the way to their winter homes. Last year they were gone by the beginning of November. Given the earlier seasons this year, I wouldn’t expect any of them to last that long here, but we will enjoy their visit as long as they choose to stay. My days off are now Friday and Saturday so that is when we expect to see the bulk of the birds each week. This week was no exception. 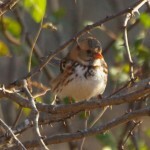 We saw 33 different birds on Friday and 47 on Saturday. 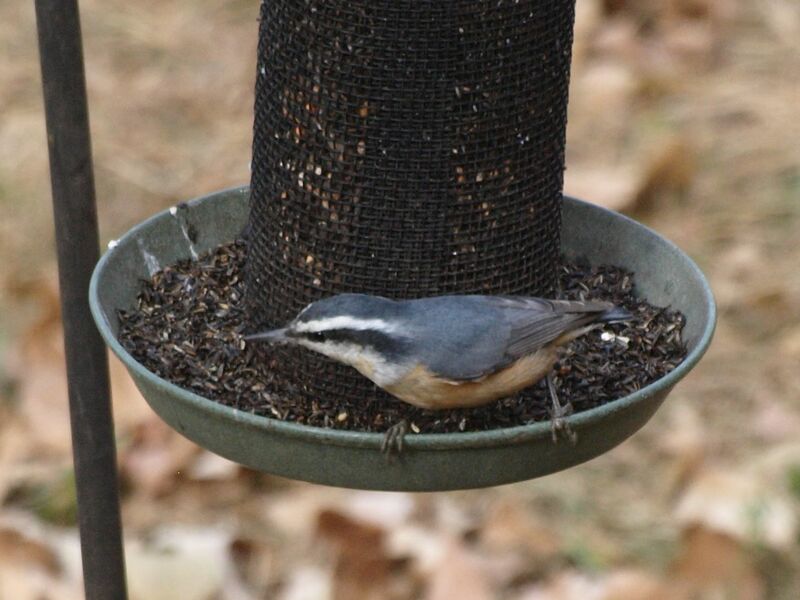 Friday was extra-special because we had our first appearance in the year for the Red-breasted Nuthatch and our first sighting in MN of the Black-throated Green Warbler. 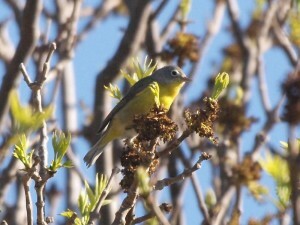 We also had a Nashville Warbler grace our yard. Not a rare bird but welcome all the same. 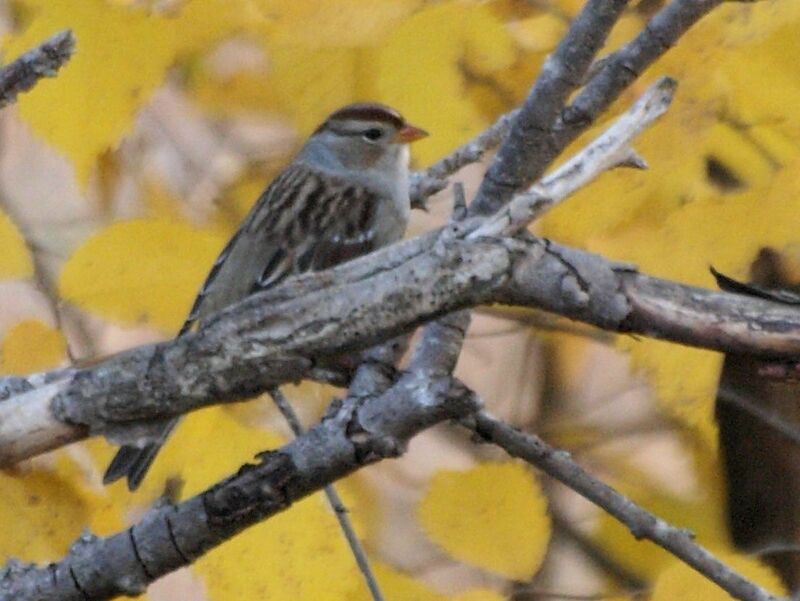 Saturday we saw some of the same birds in Pillsbury State Forest (North of Pillager, MN). 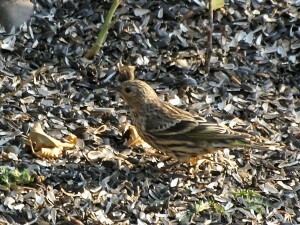 At home of Saturday we had a Pine Siskin snacking from the seeds on our driveway. 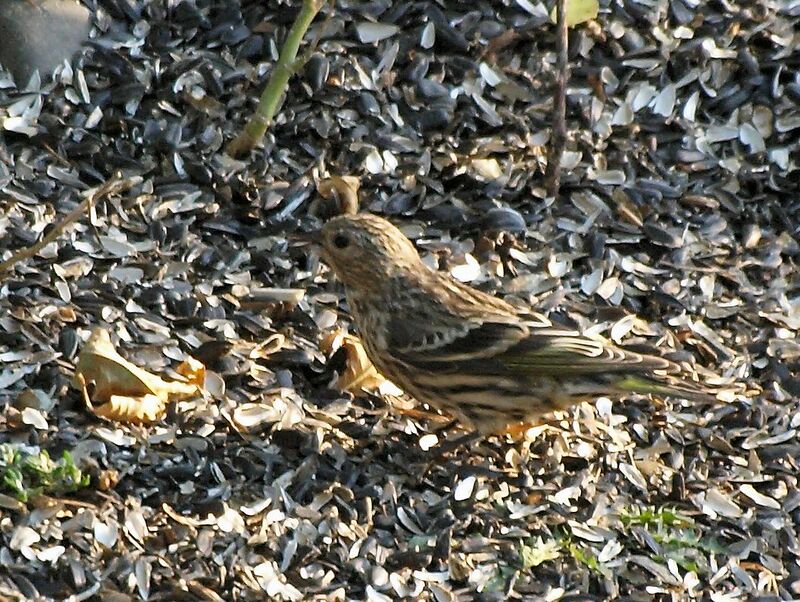 I wasn’t totally sure I had a Siskin until I looked at my photos this morning. The Fall migration season seem to be starting just a tad early this year. Leaves are also turning early, though this is probably a response to the drought. The Fall foliage will probably be spottier than normal. Some patches of sumac that should be bright red are already a dull rust color. We also have some confusing birds. 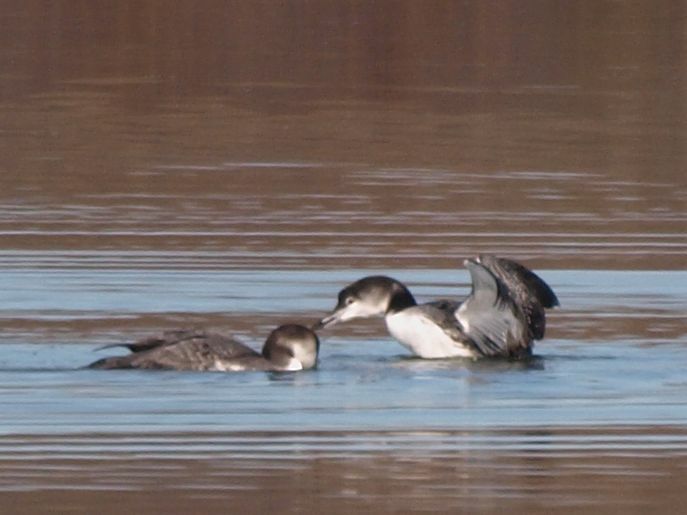 I took photos on a local lake yesterday and I still cannot figure out what it is (might be several different birds). My fist assumption was a pied-billed grebe. I have been using the Crossley ID book as an aide. Still not sure. Below is a photo of 2 Swans, I think they are Trumpeter Swans but I will accept corrections if I am wrong. Just a few weeks ago I saw a flock of Red-winged Blackbirds that I estimate contained at least 500 birds. I saw it when I was walking Sierra. Naturally I didn’t have my camera. I assume that the large flock was getting ready to migrate. Do I know the flock was all Red-wings? No, but given that we live on a lake it is a fair assumption that it was almost all Red-wings. After a very busy Summer the local Red-winged Blackbird population has thinned out tremendously. 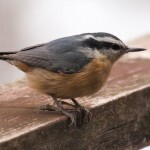 They were eating us out of house and home during the mid-Summer but now a cake of suet can last a few days, instead of only half a day. Late this afternoon I heard a lot of squawking. 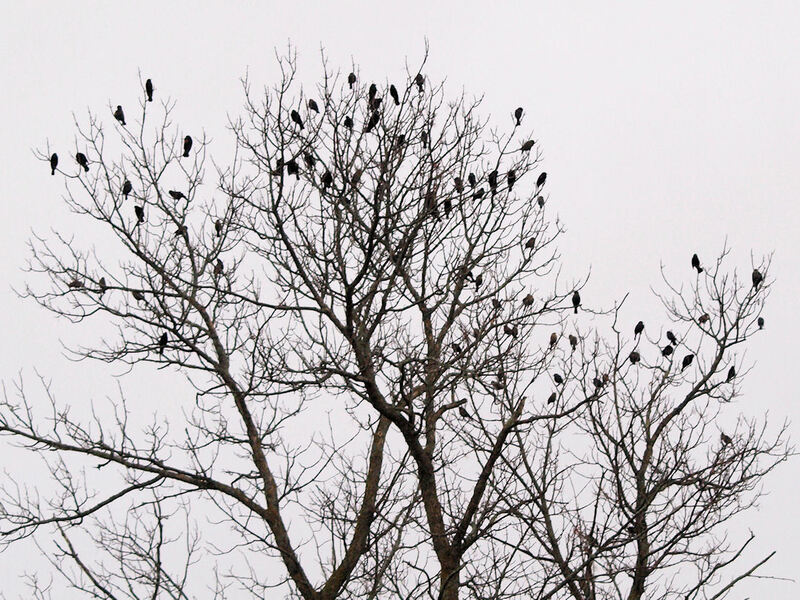 Looking at our neighbors trees I saw a flock of blackbirds in 2 trees that I estimated as about 80 birds. 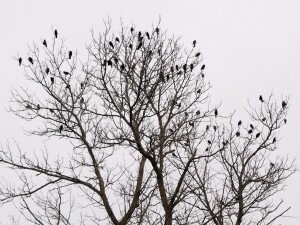 After looking at one of the photos I have counted over 70 birds in one tree. 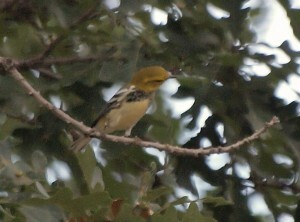 In the second tree I saw over 30. So, one has to estimate that correct total as better than 100 birds. This is the first year we have lived on a lake with a large and noisy breeding population. When we lived in Randall we didn’t record bird observations quite as completely but even last year we didn’t record any Red-winged Blackbirds after mid October. It is nearly November. We know that most of them migrate. So perhaps this is goodbye for this Fall. 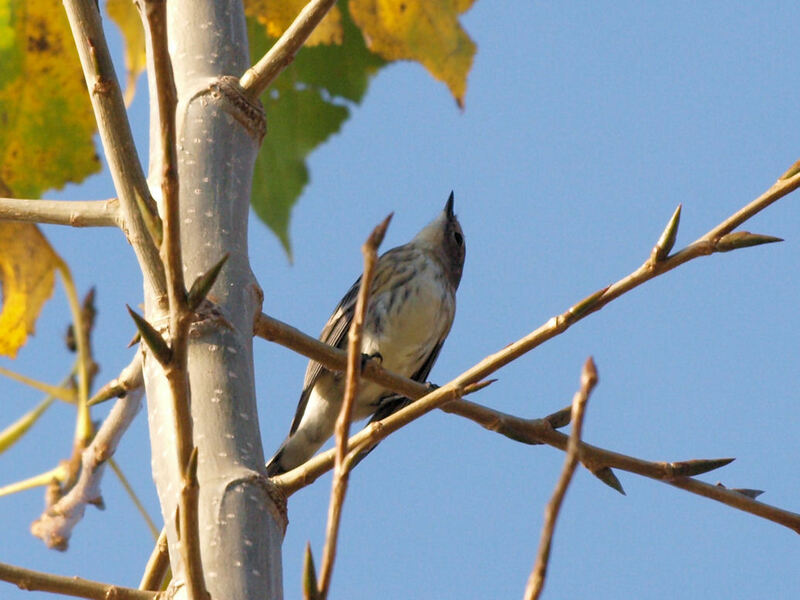 When I lived in NJ I paid attention to the migrating birds. 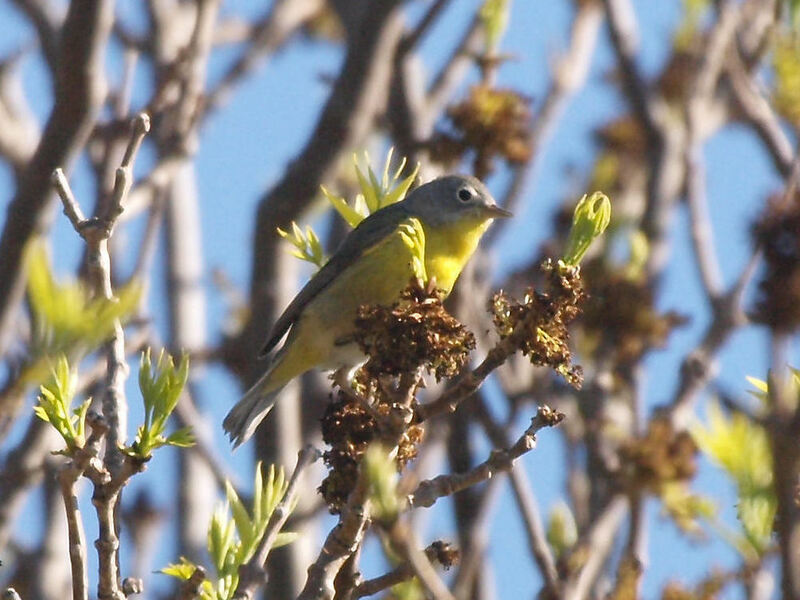 In Spring, I knew when the Warblers came in and what the peak times for migration were. 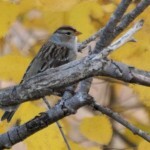 Fall migration seems more extended. 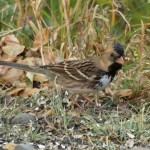 Some birds are going South by mid August, but birds are still migrating in October. 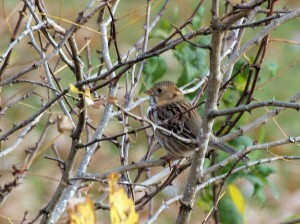 In Minnesota migration seasons aren’t quite as dramatic but the end result in Fall is far more grim. The number of birds one can see on any one day is very small. Given the weather, conditions aren’t conducive to long treks in state park. 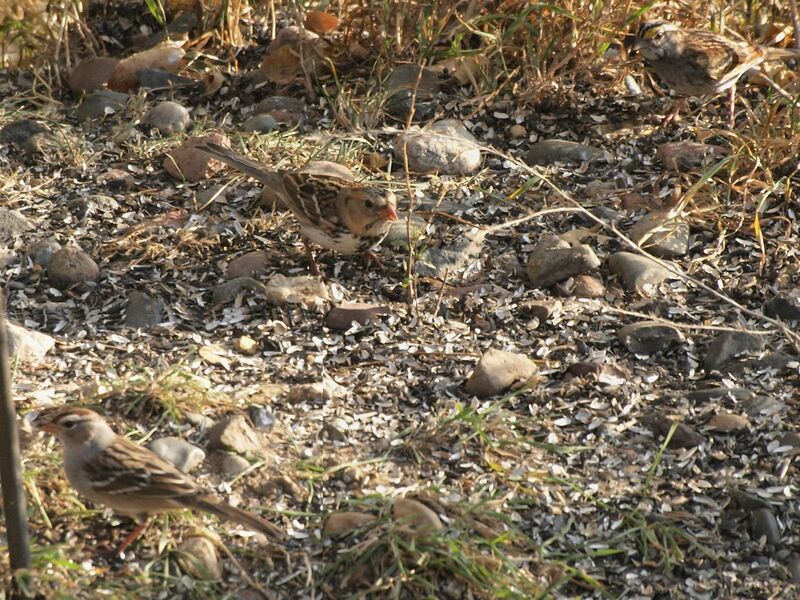 So, we are bidding our yearly farewell to both our Summer friends such as the Chipping Sparrow and Fall visitors like the Harris’s Sparrow. 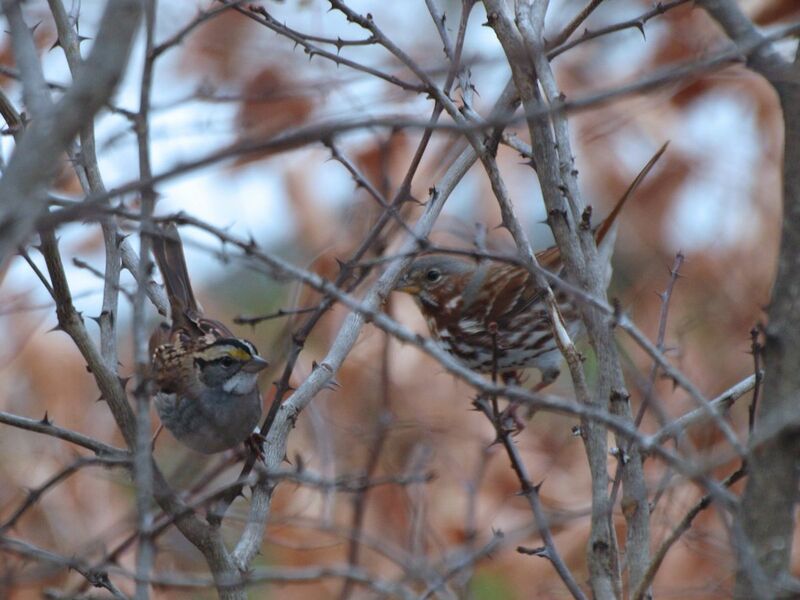 As of today we still have the White-crowned and White-throated Sparrows. We have had 4 days in a row of strong North-westerly winds. The Sapsuckers and the last of the Warblers have gone. Looking at past years I would assume that the White-throateds and Whited-crowneds will soon be gone. 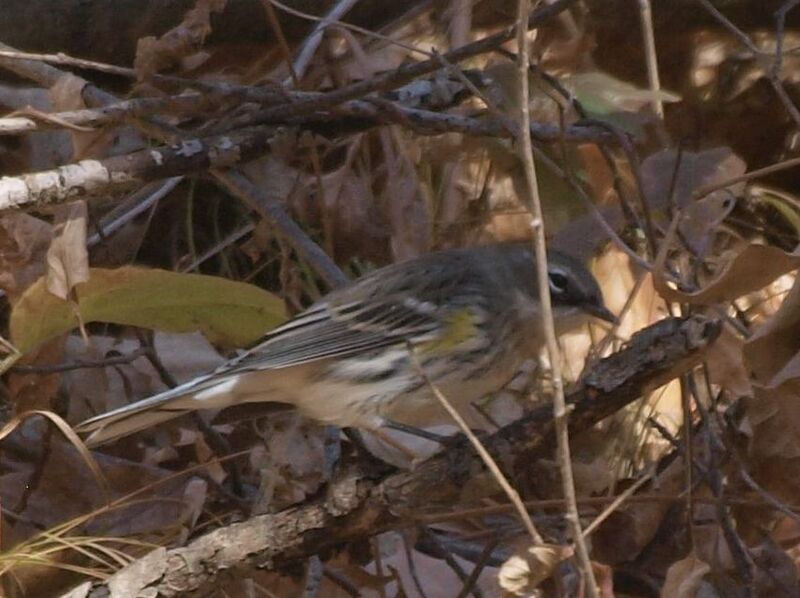 Below is a shot of a Yellow-rumped Warbler. They were all over the place only 4 days ago and now they seem to be gone. We have had an early beginning to the heating season this year. We had our first frost on Sept 15th. Last year the first frost wasn’t until October 3rd. September also had very warm days, reaching 88 on Sept 9 and 10. Still it seems like an early fall. The leaves are maxing out a few days early. Some of the birds seem early. 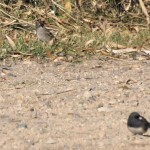 We saw a Junco in Randall on Wednesday. 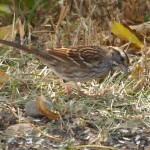 Today we had a Harris’s Sparrow today and we had a White-crowned Sparrow both yesterday and today. We haven’t been here long enough to have much of a track record. Does than mean an early winter? The next few weeks will settle that question. We are in mid September now. The weather has been close to normal, if one only looks at the means, but the highs and lows have been on the extreme side. We had a hot day of 88 on 9/10. We had our first frost on 9/15/11. Last year our first below freezing day was on October 2. With that frost, the Hummingbirds are gone and we have put the nectar feeder away for the season. We saw our last Hummer on 9/11/11. So, it is Fall for real now. We are burning oil and waiting for the migrating birds. This week we saw a Nashville Warbler, a Tennessee Warbler, a Yellow-rumped Warbler and a Ruby-crowned Kinglet. (The Nashville photo is from May 2011, the image from 2 days ago is poor.) 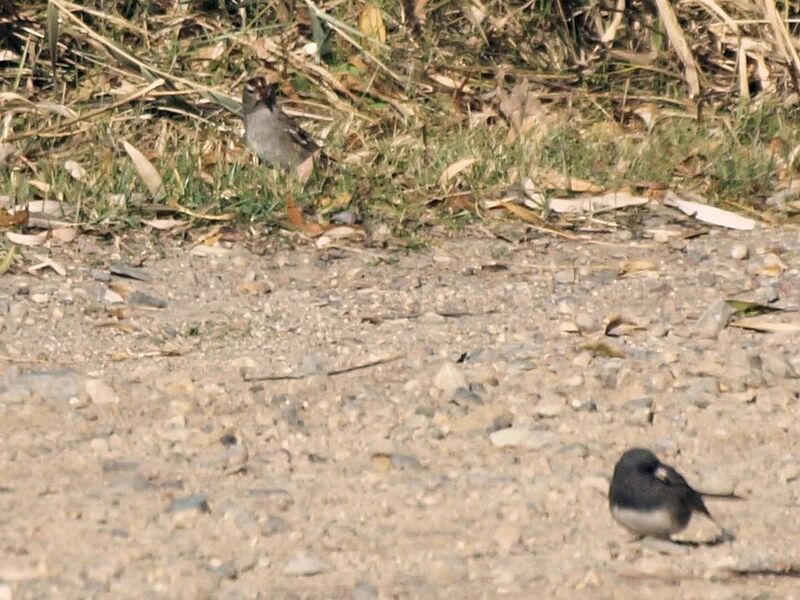 Our first Junco’s should show up in ten days or so. Given the sudden cool weather it may be earlier.